OAK supports the needs of the news media to get photos, b-roll and to conduct recorded and live interviews for their stories. Media representatives must be credentialed and should contact OAK's Media Relations Office prior to coming out to the airport. Be prepared to show media credentials and a driver's license to and have the vehicle searched by Alameda County Sheriff representatives prior to parking in OAK's "Live Media" parking area. 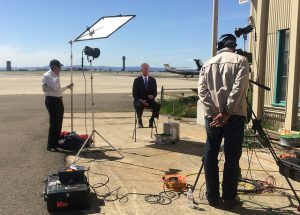 The Live Media stalls may be used only when covering a story or event at OAK and going "live" from the airport. All other media vehicles may park in the public lots located across from the terminals. On Airport Drive proceed toward the terminals. Continue past Terminal 2 bag claim and get in right lane. Exit on Neil Armstrong Way and turn right at stop sign. Turn right on Edward White Way. Continue for approximately 1/4-mile to Live Media Parking Lot entrance located on right. To contact OAK Media Relations, members of the media may call the 24-Hour OAK Media Hotline at (510) 563-6500. All commercial filming, videography and photography requests must be reviewed and approved by OAK management. A minimum of two weeks is required for this process. Interested parties should review OAK's Filming Requirements document prior to submitting a Free Speech Permit for review. For additional information, please call OAK Landside Operations Department at (510) 563-2849. A free speech permit is required for any free speech activities that take place at Oakland International Airport. To obtain a permit, please download the Free Speech application and submit it to Dominic Stuth at dstuth@portoakland.com.